It has often been said that we eat first with our eyes. In other words, food must be delicious but it must also be beautifully presented. Where better to derive inspiration for your Thanksgiving tablescape than from the tables of artists and designers? Here are some stylishly set tables from the collections of the Archives of American Art. 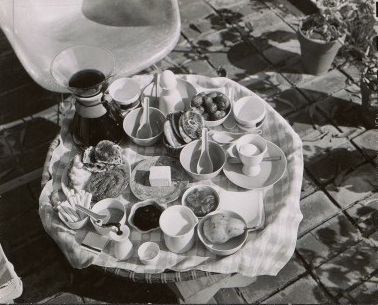 Table setting at the Eames House, ca. 1950 / unidentified photographer. Aline and Eero Saarinen papers, 1906-1977. Archives of American Art, Smithsonian Institution. Husband and wife design team Charles and Ray Eames are perhaps best known for their graceful swooping chairs either in molded plastic or bentwood and leather, still coveted by hipsters and spawning leagues of knockoffs today. Their breakfast table, seen here, features similar clean lines in the simple dishware they selected. Not fancy by any means but immensely appealing nonetheless. 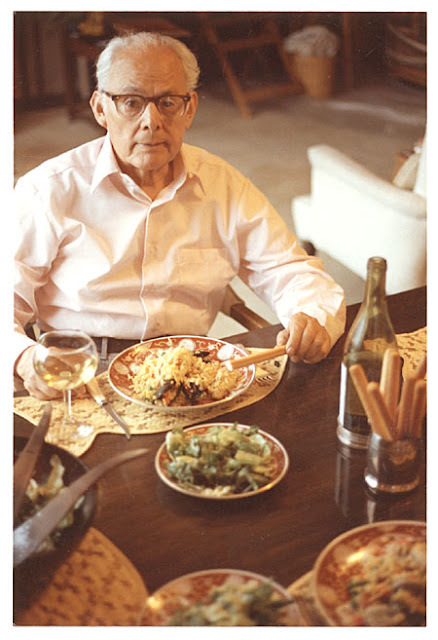 Antonio Sotomayor dining on paella, 1983 / Grace Sotomayor, photographer. Antonio Sotomayor papers, circa 1920-1988. Archives of American Art, Smithsonian Institution. Bolivian-born Antonio Sotomayor is primarily known for his murals, but he also worked as a ceramicist. Perhaps the paella he is enjoying here is served on plates of his own design! I can't help but want to pull up a seat to this table. The warm wood, the classic cup full of breadsticks, and the whimsical fish-shaped place mats all make for a very welcoming atmosphere. 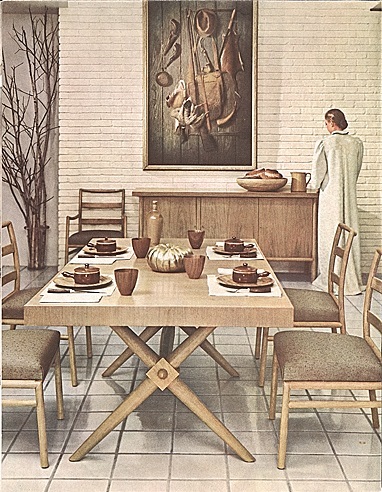 Dining room by Robsjohn-Gibbings, 1950. Terence Harold Robsjohn-Gibbings papers, 1898-1977, bulk 1915-1977. Archives of American Art, Smithsonian Institution. Terence Harold Robsjohn-Gibbings immigrated to New York from London when he was 25 years old, in 1930. Spinning out cosmopolitan furniture and interior designs from his firm on Madison Avenue, he became one of the most well-known decorators in America. This glam dining room set seen above was conceived when he worked as the principal designer for the Widdicomb Furniture Company. Furniture historians may have more to say about the structure of the pieces but for me, this table is all about the gilded pumpkin centerpiece. Whether you celebrate with a gold pumpkin or not, we at the Smithsonian Collections Blog wish you a very happy, warm and safe Thanksgiving.